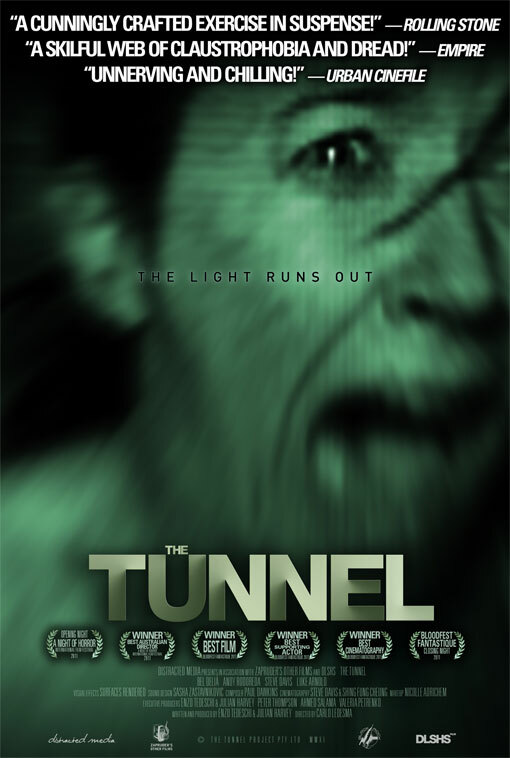 The Tunnel (2011) poster. Image Source: Tribute. Today for the countdown, see a very Millennial scary Australian film The Tunnel, which took Urbex to a dramatic level. The film begins with urban legends and conspiracy theories about unused train tunnels underneath Sydney. The plot hinges on the typical Millennial confusion between fiction and non-fiction in this faux found footage 'declassified' horror-mentary, complete with "candid interviews with the survivors." The story is very much Blair Witch meets Creep. Plot aside, this film is also interesting because of its funding and distribution model: the film was partly crowd-funded and the film-makers altered its copyright to release the movie directly to DVD and the Internet. The film "garnered much attention for its unconventional release through BitTorrent. The Tunnel is the first Australian film to be distributed and promoted legally through the BitTorrent internet downloading platform, a release strategy which could potentially expose the film to tens of millions of people, for free." The film-makers ask viewers to buy one frame of the film for one dollar, in exchange for a possible share in the profits: "On a date yet to be determined by the Producers, one of these frames will be selected at the sole discretion of the Producers to receive a 1% profit share in the movie. The 1% profit share will only produce revenue once the project is deemed to be in profit. Profit occurs after the US$135,000 to complete production has been recouped and all costs associated with further exploitation of the movie and other elements of the project have been reimbursed. The recipient of the 1% share will be contacted via email or telephone." The Tunnel (2011), rated 14A. Video Source: Youtube. Subtitles in 18 languages (click on the CC box, bottom right of the screen). The Tunnel is © Distracted Media / The Tunnel Project Pty Ltd and is reproduced here solely for the purpose of not-for-profit review and discussion.